Labour say plans by two police forces which could see companies take on roles normally done by officers risk "crossing a line" in to core policing. West Midlands and Surrey forces are talking to security firms about possibly transferring tasks to them. Labour said the move raised very serious concerns, while the Police Federation said it was "an extremely dangerous road to take". 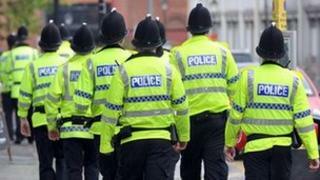 Police Minister Nick Herbert said core policing would not be privatised. The Home Office also insisted that private firms would not be able to make arrests, nor would they be solely responsible for investigating offences. Shadow home secretary Yvette Cooper said that while public-private partnerships can be effective, they "mustn't cross the line which would put public trust or the principles of impartial British policing at risk". She added: "The police have today confirmed that they are pursuing these contracts as a result of the financial pressures they face. "Yet the possibility of including the management of high-risk individuals, patrolling public places or pursuing criminal investigations in large private sector contracts rather than core professional policing raises very serious concerns." Fellow Labour MP Keith Vaz, who is also the chairman of the Commons' Home Affairs Select Committee, added his criticism, saying: "Plans to privatise its front line, particularly on the eve of the election of police and crime commissioners, is a cause for concern." Chief constables cannot ignore the financial crisis and the degree of change which is required. The Police Federation voiced a much stronger fear, with vice-chairman Simon Reed saying: "This is an extremely dangerous road to take." He added: "The priority of private companies within policing will be profit and not people, and we must not forget, they are answerable to their shareholders and not to the public we serve." The West Midlands and Surrey forces have invited bids for contracts from private firms, on behalf of all forces in England and Wales. The companies could provide services such as supporting victims of crime, investigate some crimes, manage high-risk individuals and patrol neighbourhoods. However, Policing Minister Nick Herbert said "there was absolutely no intention... that private companies will be involved in patrols". "Those are core policing functions. This is all about supporting the front line by making sure that the backroom jobs that do that can be done more efficiently," he said. "The suggestion that this is the privatisation of policing is mischievous and misguided." He said if some functions could be done behind the scenes "more efficiently by the private sector, surely that is a good thing if that's considered". The Association of Chief Police Officers (Acpo) said that the only way to cope with the financial cuts was by "radical and fundamental change [which] will allow forces to cope with this and maintain protection of the public." Chief Constable Peter Fahy, Acpo lead for workforce development, said: "Chief constables cannot ignore the financial crisis and the degree of change which is required. "Police forces across the country will be watching this tendering process closely to examine where the limits of the involvement of other bodies in policing should lie and this will be overseen by police authorities and new elected police and crime commissioners." He said there were already instances where private firms carried out policing-related functions, such as store detectives who detain shoplifters, security staff patrolling public spaces, monitoring CCTV in public spaces, and transporting prisoners between court and prison. Police are facing 20% cuts to police budgets over four years, and Home Secretary Theresa May has suggested forces could protect "front-line policing" by delegating some work to the private sector. The contract has a potential value of £1.5bn over seven years but could rise to £3.5bn, depending on how many other forces signed up, a BBC correspondent says. That would make it the largest contract to date for a private company to provide police services. Surrey Police said the force was in the early stages of a "pretty cumbersome procurement process" with the private sector. Surrey Chief Constable Lynne Owens said: "Any suggestion that a private sector company will patrol the streets of Surrey is simply nonsense. It would be no more acceptable to the public than it would be to me. "This is just an opportunity to see if the private sector can deliver some behind-the-scenes functions better and cheaper as part of a broader programme." She added: "We will not change for changes sake. Our service to the Surrey public is my priority. I will retain all accountability for operational decision making."